Businesses rarely have room in their budgets to afford expenses connected to damaged roofs. Leaks can cause numerous problems, from putting customers and employees in danger and even damaging merchandise. When you have problems with the roof on your commercial building, there are different materials you could choose. However, there are definite benefits to opting for TPO. TPO, or thermoplastic polyofin is a type of roofing that is quickly becoming more popular in the residential and commercial sector. Over the years, this has become one of the best roofing products because it offers so many different advantages, and it certainly can be used on almost any property, from houses to commercial buildings, and it is the ideal option for flat roofs in particular. TPO doesn’t just save you money by being one of the lowest priced roofing options; it also offers a variety of different advantages such as environmental friendliness and energy efficiency. TPO can be used in a number of commercial applications. This heat sealed roofing membrane will not have seams and this is a real advantage in flat roof applications. The completed look is very professional and aesthetically pleasing, which is yet another advantage for this roofing membrane material. This white material will reflect the vast majority of sunlight away from your business building, and that means a guaranteed drop in energy costs. The membrane doesn’t contain chlorine, which means it will not emit anything bad for the environment. The material is very good at withstanding many different things including chemicals, UV rays, and ozone. That means it will hold up better for a longer period of time. TPO can be used in any temperature environment, and will stay pliable in heat or cold so that it will not crack. 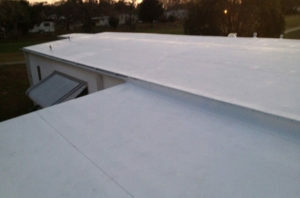 The installation process creates a seamless roof that will help you avoid leaks in the future. This membrane will be easy to repair if anything should ever damage it. In addition to the benefits we have mentioned, it is relatively affordable, especially when compared to the price of other roofing materials. Since it holds up well under harsh circumstances, it is the ideal option when you wish to avoid trouble in the future. If you are interested in a roof replacement with TPO, then contact us today. You can get in touch with us by filling out our online inquiry form, or you can call us at 800-297-3758. We are available 24 hours a day and will be happy to discuss your commercial roofing options with you.